Perhaps it’s safe to say that Knoxville’s seven-man funk unit Soulfinger aren’t the most original outfit in town, nor are they the city’s most polished pop craftsmen. But you’d be hard-pressed to find a more dynamic, viscerally charged and consistently crowd-pleasing live act—here, or anywhere else for that matter—than this eight-year-old Knox club staple. 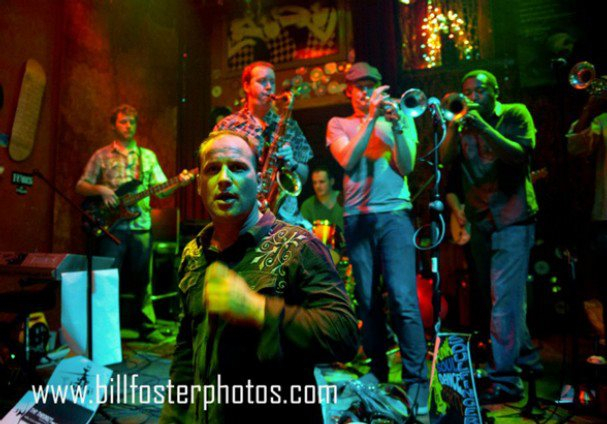 Says garrulous frontman and harp wheedler Tim Spencer, it’s all about formula—a sure-fire funk formula tested, tempered, and handed down from genre icons James Brown and Bobby Byrd, and now being fine-tuned only in the last few years of Soulfinger’s existence. “Brown and Byrd were rivals, then bandmates,” Spencer explains. “That sound, with the heavy horns and heavy driving bass, is something we’ve only had for the last three years or so, because our membership has changed some. But it’s the sound we wanted, and now that we’ve acquired it, we’re perfecting it, getting it down. “The sound is based on heavy repetition, usually in the key of D, repetitious grooves with emphasis on the first chord, that ‘D.’ Then, when you’re really driving that chord, when you change to the ‘G’ chord in the progression, the dynamics change so much it’s almost like going into a different song. If you watch the crowd, it’s like they’re all getting down, then when we hit that chord, they go through the roof. That’s when, for lack of a better word, everyone orgasms” (hmm, maybe that pimp reference isn’t so far off after all). Soulfinger began as a four-piece, a handful of blues musicians who were tired of competing for time with dozens of other workaday blues outfits in town. They began plying their trade with Spencer at center stage—a gifted frontman who is as at home with chanting, bantering, braying, call-and-response, as he is at belting out blues standards. Spencer says they, aspired to, and eventually acquired, a horn section. They issued their first record—the Soulfinger Party EP—only three years or so ago. They’ve got a full-length upcoming soon—only their second release—probably destined to see the light of day this fall. As to why they haven’t been more productive in the studio, Spencer points in part to the fact that all of Soulfinger’s members have day jobs, other responsibilities that temper youthful dreams of making music a full-time endeavor. “We’re all professionals on different levels,” he says. “We don’t even have rehearsals, except before special shows. But that helps us, too, because I’ve always said when you over-rehearse, you lose the essence of a song, because you’re trying to perfect it. And still, Soulfinger remain unparalleled in Knoxville in the realm of live performance; their shows are non-stop, sweat-soaked marathons of implosive hallelujah-funk dynamism. And it is Spencer who sets the tone and paces it all, leading the way like a combination charismatic preacher, carnie-show barker, and spiritual progeny of James Brown. What’s next for Soulfinger? Besides the new album and a First Friday soakdown at Pres Pub, they have a couple of really big gigs upcoming too, at Boomsday on the main stage in front of Calhoun’s at the riverfront on Sept. 1, and an Oktoberfest show on Oct. 12, sponsored by Restaurant Linderhof, at 12700 Kingston Pike.